Jim. Barbara. Bruce. Alfred. Oswald. Ivy. Bat fans rejoiced last night as some of the most recognized names in the DC Universe popped up on Gotham (the new show about Batman’s home town, airing on Fox.) Its premise is very similar to that of Smallville – visit our hero in his younger days, pre-cape. See what other characters have guest appearances or recurring roles. However, instead of centering around young Master Wayne, Gotham‘s hero is Jim Gordon (played by Southland‘s Ben McKenzie). Recently promoted to detective, Gordon’s first high-profile case is the murder of two of Gotham’s most prominent citizens – the Waynes. Jim promises the lone survivor of the apparent mugging-gone-bad (Bruce) that he will catch the killer. Pilot episodes always have to cram a lot into that first hour of story. This is even more so the case when it involves a story that we think we already know. You have to at least tease some familiar characters to give the fans what they want. But at the same time, if the story isn’t fresh, the viewers won’t stick around (because they HAVE already seen it). 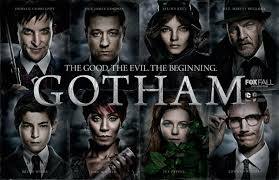 I thought that Gotham, for the most part, did a good job of keeping that balance. Fans of the GCPD (Gotham City Police Department) comics will enjoy Jim Gordon’s perspective as he tackles corruption from within the ranks of Gotham’s finest. McKenzie’s portrayal of our favorite (not yet) commissioner was spot on, and I look forward to seeing more of him. As far as teaser/cameo appearances go, my favorites were a very quizzical Edward Nigma, and younger female who looked like she could ACTUALLY be a thief or burglar, as opposed to a femme fatale in pleather. And did anyone else think a no-name stand-up comedian had just a little too much screen time? Especially after Fish Mooney utters the words “Ha ha!” instead of laughing? Just putting that out there. Yes, it was a bit of a comic book cameo fest, but it was enjoyable. Hopefully episodes to come will be able to add some depth to these characters. I, for one, will be tuning in next week. Same bat time, same bat channel.